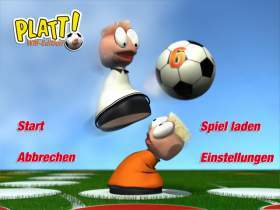 Caiman free games: Platt ! 3D WM Edition by Digital Media Vision. "Mensch ärger Dich nicht" in WM-Form! The "ludo" for 1 to 4 players (the computer can play too). Instead of playing with some horses, the game simulate a soccer game. There are many fun things as the sound effects of the soccer supporters. A really great game. 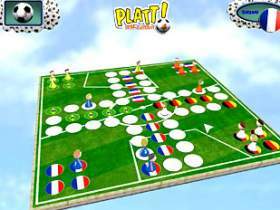 "Mens erger je niet" of "Paardjesspel" voor 1 tot 4 spelers, waarvan de computer ook 1 of meerdere spelers kan innemen. In plaats van paarden worden hier voetballers gebruikt. Het geluid van supporters en andere attractieve dingen maken het spel zeer tof.